Saturday was a monumental day for UCF, first hosting College GameDay before taking down No. 24 Cincinnati, 38-13, in primetime action. With the win, the Knights (10-0, 7-0 AAC) won their division and clinched home-field advantage in the AAC Championship Game. They moved up to No. 9 in the latest College Football Playoff rankings and will wrap up the regular season on Black Friday with a road game against rival South Florida. Before we get there, let’s check in on what else went down around the AAC in week 12. 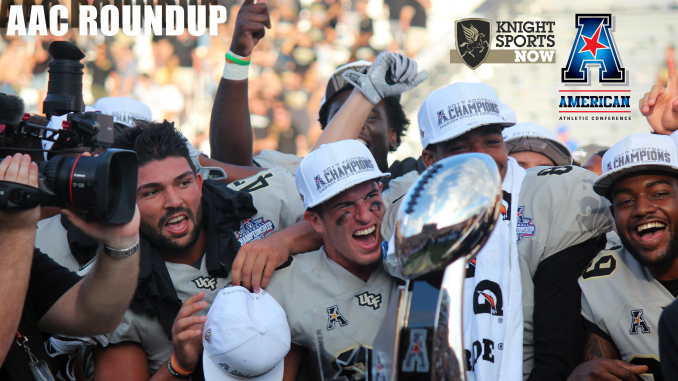 With their big win over Cincinnati, the Knights are set to play for their second straight AAC Championship on Dec. 1. The loss was the Bearcats’ second conference defeat of the year and while Temple only has one loss in AAC play, UCF owns the tiebreaker. So, even with a loss to South Florida on Friday, the Knights will host the conference title game on the first Saturday in December. As for the AAC West, things are a lot simpler after week 12. SMU needed to win out in order to win the division, but its Friday night loss to Memphis shook things up. The Tigers now have a clear shot at playing for a conference championship. Houston ended Tulane’s hopes and gave its own aspirations a boost. This week’s game between Memphis and Houston will decide the division. The Knights await the winner of what has been a wild race for the division crown. They beat Memphis 31-30 on the road earlier this season to extend their winning streak over the Tigers to 12, but haven’t played Houston since 2016.